Disclosure: Please note that the links below are affiliate links, and at no additional cost to you, I will earn a commission if you decide to purchase your supplies online. Please understand that I have experience with these products and I recommend them because they are optimal for this pattern, not because of the small commissions I make if you decide to buy them online. Please do not spend any money on these products unless you feel you need them. 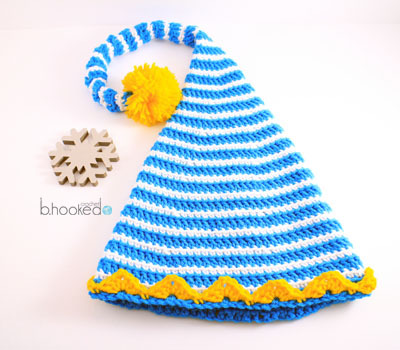 This pattern is worked from bottom to top and recommends the use of 2 – 3 colors. 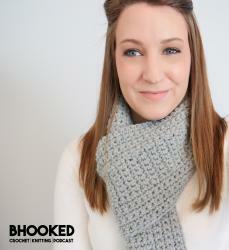 The yarn in the pattern will be labeled as “color A”, “color B” and “color C”. 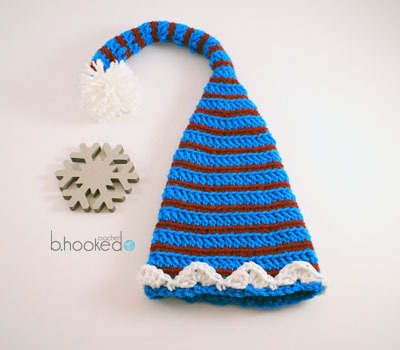 Color A refers to the color used for the double crochet rounds. This color will be the dominant color for your hat. 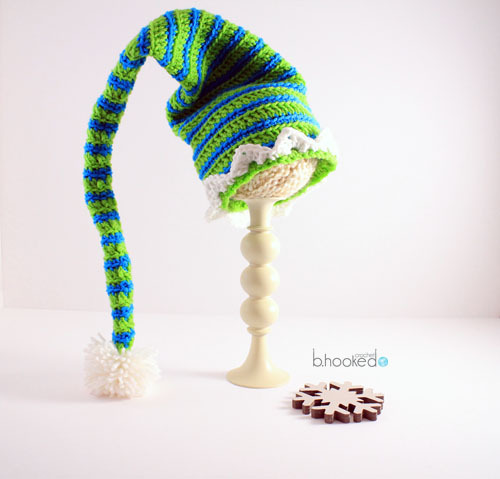 Color B refers to the color used for the single crochet rounds. Color C, which is optional, refers to the color used for the band and pom pom. 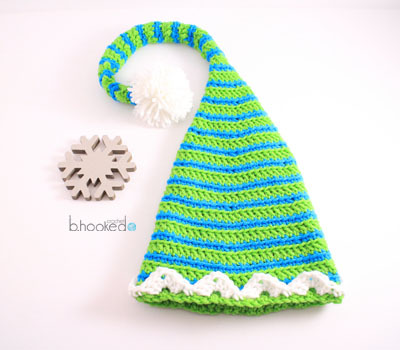 The entire hat portion of this pattern is worked in the back loops only (blo). 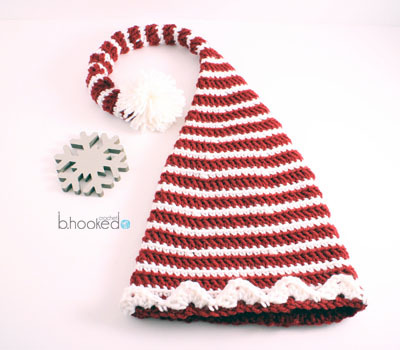 This creates a ridged texture throughout the hat. Please note that you will always work in the back loops only for this pattern. There is a beginner-friendly video tutorial available for you to view if you are just learning to crochet or are unsure of reading crochet patterns. If you are an intermediate or advanced level crocheter you will probably not need to view the video tutorial. Below you will find the sizing information for each hat. Please note that the circumference can stretch 1-2″ when they are worn if needed. This tutorial is also available in a left-handed version. Click here to be directed to the left-handed tutorial on YouTube. Round 1: Color A: Ch 47 (counts as stitch). Dc in the fourth chain from the hook and in each chain (45 sts). Once you have crocheted in every chain, join the end with the 3rd chain with a slst to form a ring. Bind off. Using your darning needle, thread the original tail (from your slip knot) and sew the 1st chain (from your ch 3) with the bottom of the last dc stitch to close up the bottom part of the round. Round 2: Color B: Ch 1 (counts as stitch). Sc in the blo of every stitch (45 sts). Join with a slst to the chain one and bind off. Round 3: Color A: Ch 3 (counts as stitch). Dc in the blo of every stitch (45 sts). Join with a slst to the 3rd chain and bind off. Round 4: Color B: Ch 1 (counts as stitch). Sc in the blo of every stitch (45 sts). Join with a slst to the chain one and bind off. Round 5: Color A: Ch 3 (counts as stitch). Dc in the blo of every stitch (45 sts). Join with a slst to the 3rd chain and bind off. Round 6: Color B: Ch 1 (counts as stitch). Sc in the blo of the next 6 sts. *Make a Sc dec over the next 2 sts. Sc in the next 7 sts. Repeat from * making a total of 5 sc decreases. (40 sts). Join with a slst to the chain one and bind off. Round 7: Color A: Ch 3 (counts as stitch). Dc in the blo of every stitch (40 sts). Join with a slst to the 3rd chain and bind off. Round 8: Color B: Ch 1 (counts as stitch). Sc in the blo of every stitch (40 sts). Join with a slst to the chain one and bind off. Round 9: Color A: Ch 3 (counts as stitch). Dc in the blo of every stitch (40 sts). Join with a slst to the 3rd chain and bind off. Round 10: Color B: Ch 1 (counts as stitch). Sc in the blo of the next 5 sts. *Make a Sc dec over the next 2 sts. Sc in the next 6 sts. Repeat from * making a total of 5 sc decreases. (35 sts). Join with a slst to the chain one and bind off. Round 11: Color A: Ch 3 (counts as stitch). Dc in the blo of every stitch (35 sts). Join with a slst to the 3rd chain and bind off. Round 12: Color B: Ch 1 (counts as stitch). Sc in the blo of every stitch (35 sts). Join with a slst to the chain one and bind off. Round 13: Color A: Ch 3 (counts as stitch). Dc in the blo of every stitch (35 sts). Join with a slst to the 3rd chain and bind off. Round 14: Color B: Ch 1 (counts as stitch). Sc in the blo of the next 4 sts. *Make a Sc dec over the next 2 sts. Sc in the next 5 sts. Repeat from * making a total of 5 sc decreases. (30 sts). Join with a slst to the chain one and bind off. Round 15: Color A: Ch 3 (counts as stitch). Dc in the blo of every stitch (30 sts). Join with a slst to the 3rd chain and bind off. Round 16: Color B: Ch 1 (counts as stitch). Sc in the blo of the next 3 sts. *Make a Sc dec over the next 2 sts. Sc in the next 4 sts. Repeat from * making a total of 5 sc decreases. (25 sts). Join with a slst to the chain one and bind off. Round 17: Color A: Ch 3 (counts as stitch). Dc in the blo of every stitch (25 sts). Join with a slst to the 3rd chain and bind off. Round 18: Color B: Ch 1 (counts as stitch). Sc in the blo of the next 2 sts. *Make a Sc dec over the next 2 sts. Sc in the next 3 sts. Repeat from * making a total of 5 sc decreases. (20 sts). Join with a slst to the chain one and bind off. Round 19: Color A: Ch 3 (counts as stitch). Dc in the blo of every stitch (20 sts). Join with a slst to the 3rd chain and bind off. Round 20: Color B: Ch 1 (counts as stitch). Sc in the blo of the next stitch. *Make a Sc dec over the next 2 sts. Sc in the next 2 sts. Repeat from * making a total of 5 sc decreases. (15 sts). Join with a slst to the chain one and bind off. Round 21: Color A: Ch 3 (counts as stitch). Dc in the blo of every stitch (15 sts). Join with a slst to the 3rd chain and bind off. Round 22: Color B: Ch 1 (counts as stitch). *Make a Sc dec over the next 2 sts. Sc in the next stitch. Repeat from * making a total of 5 sc decreases. (10 sts). Join with a slst to the chain one and bind off. Round 23: Color A: Ch 3 (counts as stitch). Dc in the blo of every stitch (10 sts). Join with a slst to the 3rd chain and bind off. Round 24: Color B: Ch 1 (counts as stitch). Sc in the blo of every stitch (10 sts). Join with a slst to the chain one and bind off. Rounds 25 – 43: Repeat rounds 23 and 24 in order. Bind off leaving yourself a tail that is approximately 6 inches long. Create a drawstring closure with that tail and your darning needle to close up the tube. Tie a knot with the tail to secure it and weave in the tail. Create and attach your pom pom. Bind on Color C in the blo of a stitch near your join seam on the back of the hat. Ch 1. *Skip 2 sts and create the following stitch sequence in the next stitch (3 Dc, 2 Ch, 3 Dc). Skip 2 sts and sc in the next. Repeat from * around the hat. Join with a slst to the chain one from your bind on. Bind off and weave in your ends. Round 1: Color A: Ch 52 (counts as stitch). Dc in the fourth chain from the hook and in each chain (50 sts) Once you have crocheted in every chain, join the end with the 3rd chain with a slst to form a ring. Bind off. Using your darning needle, thread the original tail (from your slip knot) and sew the 1st chain with the bottom of the last dc stitch to close up the bottom part of the round. Round 2: Color B: Ch 1 (counts as stitch). Sc in the blo of every stitch (50 sts). Join with a slst to the chain one and bind off. Round 3: Color A: Ch 3 (counts as stitch). Dc in the blo of every stitch (50 sts). Join with a slst to the 3rd chain and bind off. Round 4: Color B: Ch 1 (counts as stitch). Sc in the blo of every stitch (50 sts). Join with a slst to the chain one and bind off. Round 5: Color A: Ch 3 (counts as stitch). Dc in the blo of every stitch (50 sts). Join with a slst to the 3rd chain and bind off. Round 6: Color B: Ch 1 (counts as stitch). Sc in the blo of the next 7 sts. *Make a Sc dec over the next 2 sts. Sc in the next 8 sts. Repeat from * making a total of 5 sc decreases. (45 sts). Join with a slst to the chain one and bind off. Round 7: Color A: Ch 3 (counts as stitch). Dc in the blo of every stitch (45 sts). Join with a slst to the 3rd chain and bind off. Round 8: Color B: Ch 1 (counts as stitch). Sc in the blo of every stitch (45 sts). Join with a slst to the chain one and bind off. Round 9: Color A: Ch 3 (counts as stitch). Dc in the blo of every stitch (45 sts). Join with a slst to the 3rd chain and bind off. Round 10: Color B: Ch 1 (counts as stitch). Sc in the blo of the next 6 sts. *Make a Sc dec over the next 2 sts. Sc in the next 7 sts. Repeat from * making a total of 5 sc decreases. (40 sts). Join with a slst to the chain one and bind off. Round 11: Color A: Ch 3 (counts as stitch). Dc in the blo of every stitch (40 sts). Join with a slst to the 3rd chain and bind off. Round 12: Color B: Ch 1 (counts as stitch). Sc in the blo of every stitch (40 sts). Join with a slst to the chain one and bind off. Round 13: Color A: Ch 3 (counts as stitch). Dc in the blo of every stitch (40 sts). Join with a slst to the 3rd chain and bind off. Round 14: Color B: Ch 1 (counts as stitch). Sc in the blo of the next 5 sts. *Make a Sc dec over the next 2 sts. Sc in the next 6 sts. Repeat from * making a total of 5 sc decreases. (35 sts). Join with a slst to the chain one and bind off. Round 15: Color A: Ch 3 (counts as stitch). Dc in the blo of every stitch (35 sts). Join with a slst to the 3rd chain and bind off. Round 16: Color B: Ch 1 (counts as stitch). Sc in the blo of the next 4 sts. *Make a Sc dec over the next 2 sts. Sc in the next 5 sts. Repeat from * making a total of 5 sc decreases. (30 sts). Join with a slst to the chain one and bind off. Round 17: Color A: Ch 3 (counts as stitch). Dc in the blo of every stitch (30 sts). Join with a slst to the 3rd chain and bind off. Round 18: Color B: Ch 1 (counts as stitch). Sc in the blo of the next 3 sts. *Make a Sc dec over the next 2 sts. Sc in the next 4 sts. Repeat from * making a total of 5 sc decreases. (25 sts). Join with a slst to the chain one and bind off. Round 19: Color A: Ch 3 (counts as stitch). Dc in the blo of every stitch (25 sts). Join with a slst to the 3rd chain and bind off. Round 20: Color B: Ch 1 (counts as stitch). Sc in the blo of the next 2 sts. *Make a Sc dec over the next 2 sts. Sc in the next 3 sts. Repeat from * making a total of 5 sc decreases. (20 sts). Join with a slst to the chain one and bind off. Round 21: Color A: Ch 3 (counts as stitch). Dc in the blo of every stitch (20 sts). Join with a slst to the 3rd chain and bind off. Round 22: Color B: Ch 1 (counts as stitch). Sc in the blo of the next stitch. *Make a Sc dec over the next 2 sts. Sc in the next 2 sts. Repeat from * making a total of 5 sc decreases. (15 sts). Join with a slst to the chain one and bind off. Round 23: Color A: Ch 3 (counts as stitch). Dc in the blo of every stitch (15 sts). Join with a slst to the 3rd chain and bind off. Round 24: Color B: Ch 1 (counts as stitch). *Make a Sc dec over the next 2 sts. Sc in the next stitch. Repeat from * making a total of 5 sc decreases. (10 sts). Join with a slst to the chain one and bind off. Round 25: Color A: Ch 3 (counts as stitch). Dc in the blo of every stitch (10 sts). Join with a slst to the 3rd chain and bind off. Round 26: Color B: Ch 1 (counts as stitch). Sc in the blo of every stitch (10 sts). Join with a slst to the chain one and bind off. Rounds 27 – 47: Repeat rounds 25 and 26 in order. Bind off leaving yourself a tail that is approximately 6 inches long. Create a drawstring closure with that tail and your darning needle to close up the tube. Tie a knot with the tail to secure it and weave in the tail. Create and attach your pom pom. Bind on Color B in the blo of a stitch near your join seam on the back of the hat. Ch 1. *Skip 2 sts and create the following stitch sequence in the next stitch (3 Dc, 2 Ch, 3 Dc). Skip 2 sts and sc in the next. Repeat from * around the hat. Join with a slst to the chain one from your bind on. Bind off and weave in your ends. Round 1: Color A: Ch 57 (counts as stitch). Dc in the fourth chain from the hook and in each chain (55 sts) Once you have crocheted in every chain, join the end with the 3rd chain with a slst to form a ring. Bind off. Using your darning needle, thread the original tail (from your slip knot) and sew the 1st chain with the bottom of the last dc stitch to close up the bottom part of the round. Round 2: Color B: Ch 1 (counts as stitch). Sc in the blo of every stitch (55 sts). Join with a slst to the chain one and bind off. Round 3: Color A: Ch 3 (counts as stitch). Dc in the blo of every stitch (55 sts). Join with a slst to the 3rd chain and bind off. Round 4: Color B: Ch 1 (counts as stitch). Sc in the blo of every stitch (55 sts). Join with a slst to the chain one and bind off. Round 5: Color A: Ch 3 (counts as stitch). Dc in the blo of every stitch (55 sts). Join with a slst to the 3rd chain and bind off. Round 6: Color B: Ch 1 (counts as stitch). Sc in the blo of the next 8 sts. *Make a Sc dec over the next 2 sts. Sc in the next 9 sts. Repeat from * making a total of 5 sc decreases. (50 sts). Join with a slst to the chain one and bind off. Round 7: Color A: Ch 3 (counts as stitch). Dc in the blo of every stitch (50 sts). Join with a slst to the 3rd chain and bind off. Round 8: Color B: Ch 1 (counts as stitch). Sc in the blo of every stitch (50 sts). Join with a slst to the chain one and bind off. Round 9: Color A: Ch 3 (counts as stitch). Dc in the blo of every stitch (50 sts). Join with a slst to the 3rd chain and bind off. Round 10: Color B: Ch 1 (counts as stitch). Sc in the blo of the next 7 sts. *Make a Sc dec over the next 2 sts. Sc in the next 8 sts. Repeat from * making a total of 5 sc decreases. (45 sts). Join with a slst to the chain one and bind off. Round 11: Color A: Ch 3 (counts as stitch). Dc in the blo of every stitch (45 sts). Join with a slst to the 3rd chain and bind off. Round 12: Color B: Ch 1 (counts as stitch). Sc in the blo of every stitch (45 sts). Join with a slst to the chain one and bind off. Round 13: Color A: Ch 3 (counts as stitch). Dc in the blo of every stitch (45 sts). Join with a slst to the 3rd chain and bind off. Round 14: Color B: Ch 1 (counts as stitch). Sc in the blo of the next 6 sts. *Make a Sc dec over the next 2 sts. Sc in the next 7 sts. Repeat from * making a total of 5 sc decreases. (40 sts). Join with a slst to the chain one and bind off. Round 15: Color A: Ch 3 (counts as stitch). Dc in the blo of every stitch (40 sts). Join with a slst to the 3rd chain and bind off. Round 16: Color B: Ch 1 (counts as stitch). Sc in the blo of the next 5 sts. *Make a Sc dec over the next 2 sts. Sc in the next 6 sts. Repeat from * making a total of 5 sc decreases. (35 sts). Join with a slst to the chain one and bind off. Round 17: Color A: Ch 3 (counts as stitch). Dc in the blo of every stitch (35 sts). Join with a slst to the 3rd chain and bind off. Round 18: Color B: Ch 1 (counts as stitch). Sc in the blo of the next 4 sts. *Make a Sc dec over the next 2 sts. Sc in the next 5 sts. Repeat from * making a total of 5 sc decreases. (30 sts). Join with a slst to the chain one and bind off. Round 19: Color A: Ch 3 (counts as stitch). Dc in the blo of every stitch (30 sts). Join with a slst to the 3rd chain and bind off. Round 20: Color B: Ch 1 (counts as stitch). Sc in the blo of the next 3 sts. *Make a Sc dec over the next 2 sts. Sc in the next 4 sts. Repeat from * making a total of 5 sc decreases. (25 sts). Join with a slst to the chain one and bind off. Round 21: Color A: Ch 3 (counts as stitch). Dc in the blo of every stitch (25 sts). Join with a slst to the 3rd chain and bind off. Round 22: Color B: Ch 1 (counts as stitch). Sc in the blo of the next 2 sts. *Make a Sc dec over the next 2 sts. Sc in the next 3 sts. Repeat from * making a total of 5 sc decreases. (20 sts). Join with a slst to the chain one and bind off. Round 23: Color A: Ch 3 (counts as stitch). Dc in the blo of every stitch (20 sts). Join with a slst to the 3rd chain and bind off. Round 24: Color B. Ch 1 (counts as stitch). Sc in the blo of the next stitch. *Make a Sc dec over the next 2 sts. Sc in the next 2 sts. Repeat from * making a total of 5 sc decreases. (15 sts) Join with a slst to the chain one and bind off. Round 25: Color A: Ch 3 (counts as stitch). Dc in the blo of every stitch (15 sts). Join with a slst to the 3rd chain and bind off. Round 26: Color B: Ch 1 (counts as stitch). *Make a Sc dec over the next 2 sts. Sc in the next stitch. Repeat from * making a total of 5 sc decreases. (10 sts). Join with a slst to the chain one and bind off. Round 27: Color A: Ch 3 (counts as stitch). Dc in the blo of every stitch (10 sts). Join with a slst to the 3rd chain and bind off. Round 28: Color B: Ch 1 (counts as stitch). Sc in the blo of every stitch (10 sts). Join with a slst to the chain one and bind off. Rounds 29 – 49: Repeat rounds 27 and 28 in order. Bind off leaving yourself a tail that is approximately 6 inches long. Create a drawstring closure with that tail and your darning needle to close up the tube. Tie a knot with the tail to secure it and weave in the tail. 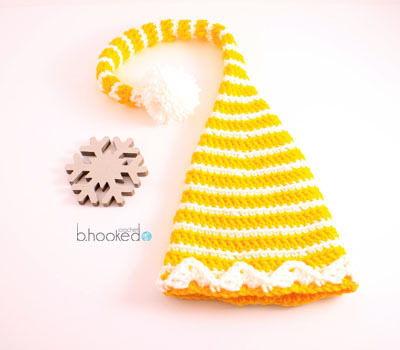 Create and attach your pom pom. Round 1: Color A: Ch 62 (counts as stitch). Dc in the fourth chain from the hook and in each chain (60 sts) Once you have crocheted in every chain, join the end with the 3rd chain with a slst to form a ring. Bind off. Using your darning needle, thread the original tail (from your slip knot) and sew the 1st chain with the bottom of the last dc stitch to close up the bottom part of the round. Round 2: Color B: Ch 1 (counts as stitch). Sc in the blo of every stitch (60 sts). Join with a slst to the chain one and bind off. Round 3: Color A: Ch 3 (counts as stitch). Dc in the blo of every stitch (60 sts). Join with a slst to the 3rd chain and bind off. Round 4: Color B: Ch 1 (counts as stitch). Sc in the blo of every stitch (60 sts). Join with a slst to the chain one and bind off. Round 5: Color A: Ch 3 (counts as stitch). Dc in the blo of every stitch (60 sts). Join with a slst to the 3rd chain and bind off. Round 6: Color B: Ch 1 (counts as stitch). Sc in the blo of the next 9 sts. *Make a Sc dec over the next 2 sts. Sc in the next 10 sts. Repeat from * making a total of 5 sc decreases. (55 sts). Join with a slst to the chain one and bind off. Round 7: Color A: Ch 3 (counts as stitch). Dc in the blo of every stitch (55 sts). Join with a slst to the 3rd chain and bind off. Round 8: Color B: Ch 1 (counts as stitch). Sc in the blo of every stitch (55 sts). Join with a slst to the chain one and bind off. Round 9: Color A: Ch 3 (counts as stitch). Dc in the blo of every stitch (55 sts). Join with a slst to the 3rd chain and bind off. Round 10: Color B: Ch 1 (counts as stitch). Sc in the blo of the next 8 sts. *Make a Sc dec over the next 2 sts. Sc in the next 9 sts. Repeat from * making a total of 5 sc decreases. (50 sts). Join with a slst to the chain one and bind off. Round 11: Color A: Ch 3 (counts as stitch). Dc in the blo of every stitch (50 sts). Join with a slst to the 3rd chain and bind off. Round 12: Color B: Ch 1 (counts as stitch). Sc in the blo of every stitch (50 sts). Join with a slst to the chain one and bind off. Round 13: Color A: Ch 3 (counts as stitch). Dc in the blo of every stitch (50 sts). Join with a slst to the 3rd chain and bind off. Round 14: Color B: Ch 1 (counts as stitch). Sc in the blo of the next 7 sts. *Make a Sc dec over the next 2 sts. Sc in the next 8 sts. Repeat from * making a total of 5 sc decreases. (45 sts). Join with a slst to the chain one and bind off. Round 15: Color A: Ch 3 (counts as stitch). Dc in the blo of every stitch (45 sts). Join with a slst to the 3rd chain and bind off. Round 16: Color B: Ch 1 (counts as stitch). Sc in the blo of the next 6 sts. *Make a Sc dec over the next 2 sts. Sc in the next 7 sts. Repeat from * making a total of 5 sc decreases. (40 sts). Join with a slst to the chain one and bind off. Round 17: Color A: Ch 3 (counts as stitch). Dc in the blo of every stitch (40 sts). Join with a slst to the 3rd chain and bind off. Round 18: Color B: Ch 1 (counts as stitch). Sc in the blo of the next 5 sts. *Make a Sc dec over the next 2 sts. Sc in the next 6 sts. Repeat from * making a total of 5 sc decreases. (35 sts). Join with a slst to the chain one and bind off. Round 19: Color A: Ch 3 (counts as stitch). Dc in the blo of every stitch (35 sts). Join with a slst to the 3rd chain and bind off. Round 20: Color B: Ch 1 (counts as stitch). Sc in the blo of the next 4 sts. *Make a Sc dec over the next 2 sts. Sc in the next 5 sts. Repeat from * making a total of 5 sc decreases. (30 sts). Join with a slst to the chain one and bind off. Round 21: Color A: Ch 3 (counts as stitch). Dc in the blo of every stitch (30 sts). Join with a slst to the 3rd chain and bind off. Round 22: Color B: Ch 1 (counts as stitch). Sc in the blo of the next 3 sts. *Make a Sc dec over the next 2 sts. Sc in the next 4 sts. Repeat from * making a total of 5 sc decreases. (25 sts). Join with a slst to the chain one and bind off. Round 23: Color A: Ch 3 (counts as stitch). Dc in the blo of every stitch (25 sts). Join with a slst to the 3rd chain and bind off. Round 24: Color B: Ch 1 (counts as stitch). Sc in the blo of the next 2 sts. *Make a Sc dec over the next 2 sts. Sc in the next 3 sts. Repeat from * making a total of 5 sc decreases. (20 sts). Join with a slst to the chain one and bind off. Round 25: Color A: Ch 3 (counts as stitch). Dc in the blo of every stitch (20 sts). Join with a slst to the 3rd chain and bind off. Round 26: Color B. Ch 1 (counts as stitch). Sc in the blo of the next stitch. *Make a Sc dec over the next 2 sts. Sc in the next 2 sts. Repeat from * making a total of 5 sc decreases. (15 sts) Join with a slst to the chain one and bind off. Round 27: Color A: Ch 3 (counts as stitch). Dc in the blo of every stitch (15 sts). Join with a slst to the 3rd chain and bind off. Round 28: Color B: Ch 1 (counts as stitch). *Make a Sc dec over the next 2 sts. Sc in the next stitch. Repeat from * making a total of 5 sc decreases. (10 sts). Join with a slst to the chain one and bind off. Round 29: Color A: Ch 3 (counts as stitch). Dc in the blo of every stitch (10 sts). Join with a slst to the 3rd chain and bind off. Round 30: Color B: Ch 1 (counts as stitch). Sc in the blo of every stitch (10 sts). Join with a slst to the chain one and bind off. Rounds 31 – 53: Repeat rounds 29 and 30 in order. Bind off leaving yourself a tail that is approximately 6 inches long. Create a drawstring closure with that tail and your darning needle to close up the tube. Tie a knot with the tail to secure it and weave in the tail. 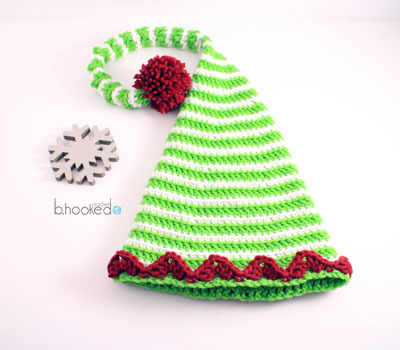 Create and attach your pom pom. Round 1: Color A: Ch 67 (counts as stitch). Dc in the fourth chain from the hook and in each chain (65 sts) Once you have crocheted in every chain, join the end with the 3rd chain with a slst to form a ring. Bind off. Using your darning needle, thread the original tail (from your slip knot) and sew the 1st chain with the bottom of the last dc stitch to close up the bottom part of the round. Round 2: Color B: Ch 1 (counts as stitch). Sc in the blo of every stitch (65 sts). Join with a slst to the chain one and bind off. Round 3: Color A: Ch 3 (counts as stitch). Dc in the blo of every stitch (65 sts). Join with a slst to the 3rd chain and bind off. Round 4: Color B: Ch 1 (counts as stitch). Sc in the blo of every stitch (65 sts). Join with a slst to the chain one and bind off. Round 5: Color A: Ch 3 (counts as stitch). Dc in the blo of every stitch (65 sts). Join with a slst to the 3rd chain and bind off. Round 6: Color B: Ch 1 (counts as stitch). Sc in the blo of the next 10 sts. *Make a Sc dec over the next 2 sts. Sc in the next 11 sts. Repeat from * making a total of 5 sc decreases. (60 sts). Join with a slst to the chain one and bind off. Round 7: Color A: Ch 3 (counts as stitch). Dc in the blo of every stitch (60 sts). Join with a slst to the 3rd chain and bind off. Round 8: Color B: Ch 1 (counts as stitch). Sc in the blo of every stitch (60 sts). Join with a slst to the chain one and bind off. Round 9: Color A: Ch 3 (counts as stitch). Dc in the blo of every stitch (60 sts). Join with a slst to the 3rd chain and bind off. Round 10: Color B: Ch 1 (counts as stitch). Sc in the blo of the next 9 sts. *Make a Sc dec over the next 2 sts. Sc in the next 10 sts. Repeat from * making a total of 5 sc decreases. (55 sts). Join with a slst to the chain one and bind off. Round 11: Color A: Ch 3 (counts as stitch). Dc in the blo of every stitch (55 sts). Join with a slst to the 3rd chain and bind off. Round 12: Color B: Ch 1 (counts as stitch). Sc in the blo of every stitch (55 sts). Join with a slst to the chain one and bind off. Round 13: Color A: Ch 3 (counts as stitch). Dc in the blo of every stitch (55 sts). Join with a slst to the 3rd chain and bind off. Round 14: Color B: Ch 1 (counts as stitch). Sc in the blo of the next 8 sts. *Make a Sc dec over the next 2 sts. Sc in the next 9 sts. Repeat from * making a total of 5 sc decreases. (50 sts). Join with a slst to the chain one and bind off. Round 15: Color A: Ch 3 (counts as stitch). Dc in the blo of every stitch (50 sts). Join with a slst to the 3rd chain and bind off. Round 16: Color B: Ch 1 (counts as stitch). Sc in the blo of the next 7 sts. *Make a Sc dec over the next 2 sts. Sc in the next 8 sts. Repeat from * making a total of 5 sc decreases. (45 sts). Join with a slst to the chain one and bind off. Round 17: Color A: Ch 3 (counts as stitch). Dc in the blo of every stitch (45 sts). Join with a slst to the 3rd chain and bind off. Round 18: Color B: Ch 1 (counts as stitch). Sc in the blo of the next 6 sts. *Make a Sc dec over the next 2 sts. Sc in the next 7 sts. Repeat from * making a total of 5 sc decreases. (40 sts). Join with a slst to the chain one and bind off. Round 19: Color A: Ch 3 (counts as stitch). Dc in the blo of every stitch (40 sts). Join with a slst to the 3rd chain and bind off. Round 20: Color B: Ch 1 (counts as stitch). Sc in the blo of the next 5 sts. *Make a Sc dec over the next 2 sts. Sc in the next 6 sts. Repeat from * making a total of 5 sc decreases. (35 sts). Join with a slst to the chain one and bind off. Round 21: Color A: Ch 3 (counts as stitch). Dc in the blo of every stitch (35 sts). Join with a slst to the 3rd chain and bind off. Round 22: Color B: Ch 1 (counts as stitch). Sc in the blo of the next 4 sts. *Make a Sc dec over the next 2 sts. Sc in the next 5 sts. Repeat from * making a total of 5 sc decreases. (30 sts). Join with a slst to the chain one and bind off. Round 23: Color A: Ch 3 (counts as stitch). Dc in the blo of every stitch (30 sts). Join with a slst to the 3rd chain and bind off. Round 24: Color B: Ch 1 (counts as stitch). Sc in the blo of the next 3 sts. *Make a Sc dec over the next 2 sts. Sc in the next 4 sts. Repeat from * making a total of 5 sc decreases. (25 sts). Join with a slst to the chain one and bind off. Round 25: Color A: Ch 3 (counts as stitch). Dc in the blo of every stitch (25 sts). Join with a slst to the 3rd chain and bind off. Round 26: Color B: Ch 1 (counts as stitch). Sc in the blo of the next 2 sts. *Make a Sc dec over the next 2 sts. Sc in the next 3 sts. Repeat from * making a total of 5 sc decreases. (20 sts). Join with a slst to the chain one and bind off. Round 27: Color A: Ch 3 (counts as stitch). Dc in the blo of every stitch (20 sts). Join with a slst to the 3rd chain and bind off. Round 28: Color B. Ch 1 (counts as stitch). Sc in the blo of the next stitch. *Make a Sc dec over the next 2 sts. Sc in the next 2 sts. Repeat from * making a total of 5 sc decreases. (15 sts) Join with a slst to the chain one and bind off. Round 29: Color A: Ch 3 (counts as stitch). Dc in the blo of every stitch (15 sts). Join with a slst to the 3rd chain and bind off. Round 30: Color B: Ch 1 (counts as stitch). *Make a Sc dec over the next 2 sts. Sc in the next stitch. Repeat from * making a total of 5 sc decreases. (10 sts). Join with a slst to the chain one and bind off. Round 31: Color A: Ch 3 (counts as stitch). Dc in the blo of every stitch (10 sts). Join with a slst to the 3rd chain and bind off. Round 32: Color B: Ch 1 (counts as stitch). Sc in the blo of every stitch (10 sts). Join with a slst to the chain one and bind off. Rounds 33 – 55: Repeat rounds 31 and 32 in order. Bind off leaving yourself a tail that is approximately 6 inches long. Create a drawstring closure with that tail and your darning needle to close up the tube. Tie a knot with the tail to secure it and weave in the tail. Create and attach your pom pom. Round 1: Color A: Ch 72 (counts as stitch). Dc in the fourth chain from the hook and in each chain (70 sts) Once you have crocheted in every chain, join the end with the 3rd chain with a slst to form a ring. Bind off. Using your darning needle, thread the original tail (from your slip knot) and sew the 1st chain with the bottom of the last dc stitch to close up the bottom part of the round. Round 2: Color B: Ch 1 (counts as stitch). Sc in the blo of every stitch (70 sts). Join with a slst to the chain one and bind off. Round 3: Color A: Ch 3 (counts as stitch). Dc in the blo of every stitch (70 sts). Join with a slst to the 3rd chain and bind off. Round 4: Color B: Ch 1 (counts as stitch). Sc in the blo of every stitch (70 sts). Join with a slst to the chain one and bind off. Round 5: Color A: Ch 3 (counts as stitch). Dc in the blo of every stitch (70 sts). Join with a slst to the 3rd chain and bind off. Round 6: Color B: Ch 1 (counts as stitch). Sc in the blo of the next 11 sts. *Make a Sc dec over the next 2 sts. Sc in the next 12 sts. Repeat from * making a total of 5 sc decreases. (65 sts). Join with a slst to the chain one and bind off. Round 7: Color A: Ch 3 (counts as stitch). Dc in the blo of every stitch (65 sts). Join with a slst to the 3rd chain and bind off. Round 8: Color B: Ch 1 (counts as stitch). Sc in the blo of every stitch (65 sts). Join with a slst to the chain one and bind off. Round 9: Color A: Ch 3 (counts as stitch). Dc in the blo of every stitch (65 sts). Join with a slst to the 3rd chain and bind off. Round 10: Color B: Ch 1 (counts as stitch). Sc in the blo of the next 10 sts. *Make a Sc dec over the next 2 sts. Sc in the next 11 sts. Repeat from * making a total of 5 sc decreases. (60 sts). Join with a slst to the chain one and bind off. Round 11: Color A: Ch 3 (counts as stitch). Dc in the blo of every stitch (60 sts). Join with a slst to the 3rd chain and bind off. Round 12: Color B: Ch 1 (counts as stitch). Sc in the blo of every stitch (60 sts). Join with a slst to the chain one and bind off. Round 13: Color A: Ch 3 (counts as stitch). Dc in the blo of every stitch (60 sts). Join with a slst to the 3rd chain and bind off. Round 14: Color B: Ch 1 (counts as stitch). Sc in the blo of the next 9 sts. *Make a Sc dec over the next 2 sts. Sc in the next 10 sts. Repeat from * making a total of 5 sc decreases. (55 sts). Join with a slst to the chain one and bind off. Round 15: Color A: Ch 3 (counts as stitch). Dc in the blo of every stitch (55 sts). Join with a slst to the 3rd chain and bind off. Round 16: Color B: Ch 1 (counts as stitch). Sc in the blo of the next 8 sts. *Make a Sc dec over the next 2 sts. Sc in the next 9 sts. Repeat from * making a total of 5 sc decreases. (50 sts). Join with a slst to the chain one and bind off. Round 17: Color A: Ch 3 (counts as stitch). Dc in the blo of every stitch (50 sts). Join with a slst to the 3rd chain and bind off. Round 18: Color B: Ch 1 (counts as stitch). Sc in the blo of the next 7 sts. *Make a Sc dec over the next 2 sts. Sc in the next 8 sts. Repeat from * making a total of 5 sc decreases. (45 sts). Join with a slst to the chain one and bind off. Round 19: Color A: Ch 3 (counts as stitch). Dc in the blo of every stitch (45 sts). Join with a slst to the 3rd chain and bind off. Round 20: Color B: Ch 1 (counts as stitch). Sc in the blo of the next 6 sts. *Make a Sc dec over the next 2 sts. Sc in the next 7 sts. Repeat from * making a total of 5 sc decreases. (40 sts). Join with a slst to the chain one and bind off. Round 21: Color A: Ch 3 (counts as stitch). Dc in the blo of every stitch (40 sts). Join with a slst to the 3rd chain and bind off. Round 22: Color B: Ch 1 (counts as stitch). Sc in the blo of the next 5 sts. *Make a Sc dec over the next 2 sts. Sc in the next 6 sts. Repeat from * making a total of 5 sc decreases. (35 sts). Join with a slst to the chain one and bind off. Round 23: Color A: Ch 3 (counts as stitch). Dc in the blo of every stitch (35 sts). Join with a slst to the 3rd chain and bind off. Round 24: Color B: Ch 1 (counts as stitch). Sc in the blo of the next 4 sts. *Make a Sc dec over the next 2 sts. Sc in the next 5 sts. Repeat from * making a total of 5 sc decreases. (30 sts). Join with a slst to the chain one and bind off. Round 25: Color A: Ch 3 (counts as stitch). Dc in the blo of every stitch (30 sts). Join with a slst to the 3rd chain and bind off. Round 26: Color B: Ch 1 (counts as stitch). Sc in the blo of the next 3 sts. *Make a Sc dec over the next 2 sts. Sc in the next 4 sts. Repeat from * making a total of 5 sc decreases. (25 sts). Join with a slst to the chain one and bind off. Round 27: Color A: Ch 3 (counts as stitch). Dc in the blo of every stitch (25 sts). Join with a slst to the 3rd chain and bind off. Round 28: Color B: Ch 1 (counts as stitch). Sc in the blo of the next 2 sts. *Make a Sc dec over the next 2 sts. Sc in the next 3 sts. Repeat from * making a total of 5 sc decreases. (20 sts). Join with a slst to the chain one and bind off. Round 29: Color A: Ch 3 (counts as stitch). Dc in the blo of every stitch (20 sts). Join with a slst to the 3rd chain and bind off. Round 31: Color A: Ch 3 (counts as stitch). Dc in the blo of every stitch (15 sts). Join with a slst to the 3rd chain and bind off. Round 32: Color B: Ch 1 (counts as stitch). *Make a Sc dec over the next 2 sts. Sc in the next stitch. Repeat from * making a total of 5 sc decreases. (10 sts). Join with a slst to the chain one and bind off. Round 33: Color A: Ch 3 (counts as stitch). Dc in the blo of every stitch (10 sts). Join with a slst to the 3rd chain and bind off. Round 34: Color B: Ch 1 (counts as stitch). Sc in the blo of every stitch (10 sts). Join with a slst to the chain one and bind off. Rounds 35 – 57: Repeat rounds 33 and 34 in order. Bind off leaving yourself a tail that is approximately 6 inches long. Create a drawstring closure with that tail and your darning needle to close up the tube. Tie a knot with the tail to secure it and weave in the tail. Create and attach your pom pom.